A lifesaving device more than 20 years in the making has received 510(k) clearance from the U.S. Food and Drug Administration (FDA). 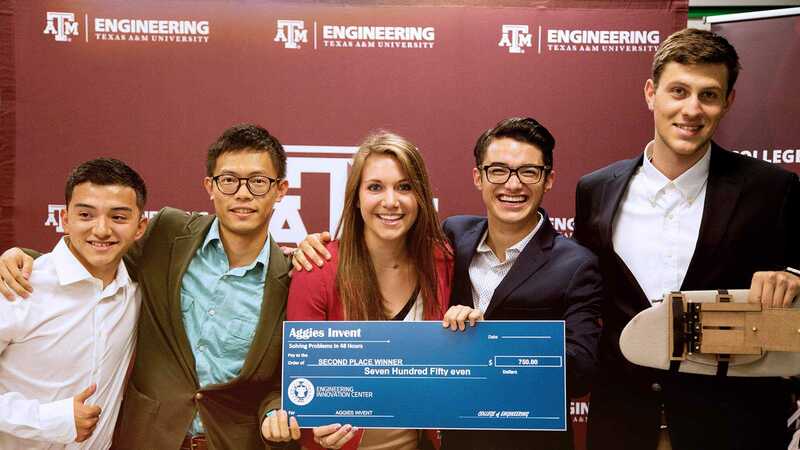 The clearance allows a company, co-founded by Associate Department Head Dr. Duncan Maitland from the Department of Biomedical Engineering at Texas A&M University, to begin to market the medical device. 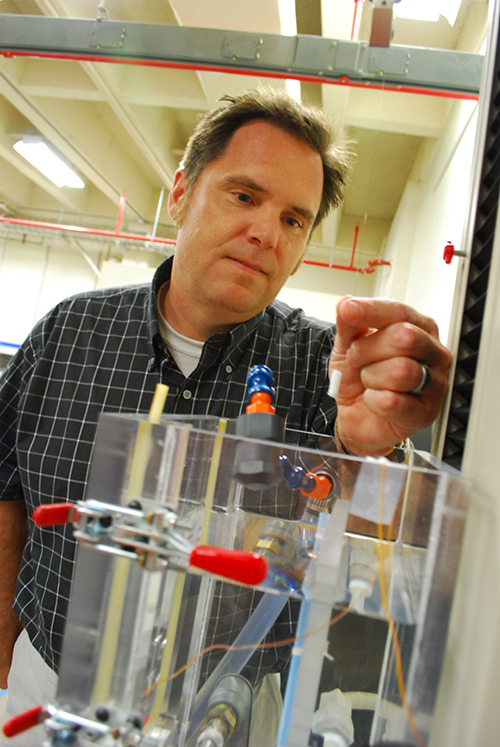 Maitland developed the IMPEDE Embolization Plug, a device that could provide doctors with a more effective and less risky method for treating aneurysms – blood-filled, balloon-like bulges in the walls of a blood vessel that can rupture and cause vascular damage that is debilitating or even fatal. The device quickly clots blood to block it from reaching aneurysms, tumors or other issues. It creates a different kind of clot than current devices. Maitland developed the IMPEDE Embolization Plug, a device that could provide doctors with a more effective and less risky method for treating aneurysms. | Image: Photo courtesy of College of Engineering. The device is made from polyurethane-based shape memory polymer (SMP) foams. While small during insertion, the porous polymeric materials are capable of growing to a “memorized” larger conformable shape when delivered into a blood vessel, allowing it to obstruct or reduce the rate of blood flow in the vein or artery targeted by the doctor. After blocking flow in a vascular target, there is also concern that one could reform over time. 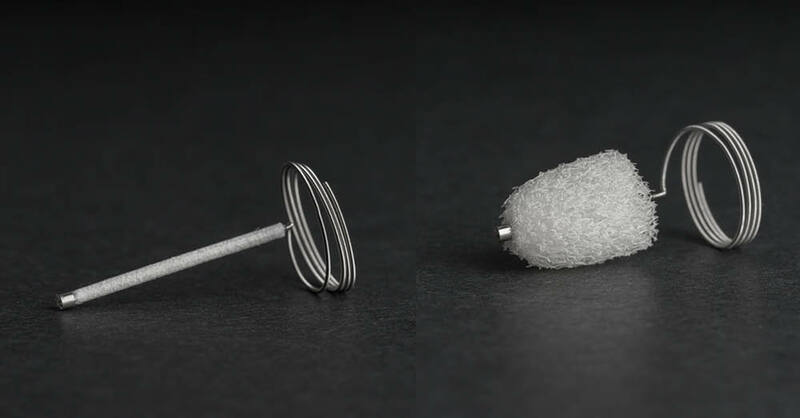 With the IMPEDE Embolization Plug, test results have shown that SMP foams promote long-term health of the areas of the blood vessel, reducing the chances that another treatment is required. “The benefit to patients is that they don’t get reoccurrence,” Maitland said. “This is a less traumatic deliverable device. As it’s being delivered, it’s not potentially rupturing the blood vessels like some of the current devices would, and it heals the site so they don’t have to have it retreated. We’ve created this stepping stone that has value, will establish the long-term clinical superiority and it will be a predicate device for future, more complicated, devices to receive regulatory clearance. While the IMPEDE device is built to address issues outside of the brain, such as abdominal aortic aneurysms, as well as acting as adjunct treatment for tumors or cancer to promote long-term healing where current devices don’t. Maitland said he plans to submit the FDA application for a neurological device soon. “We’ve created this stepping stone that has value, will establish the long-term clinical superiority and it will be a predicate device for future, more complicated, devices to receive regulatory clearance,” Maitland said. The device is made from polyurethane-based shape memory polymer foams that are capable of growing to a “memorized” larger conformable shape when delivered into a blood vessel. 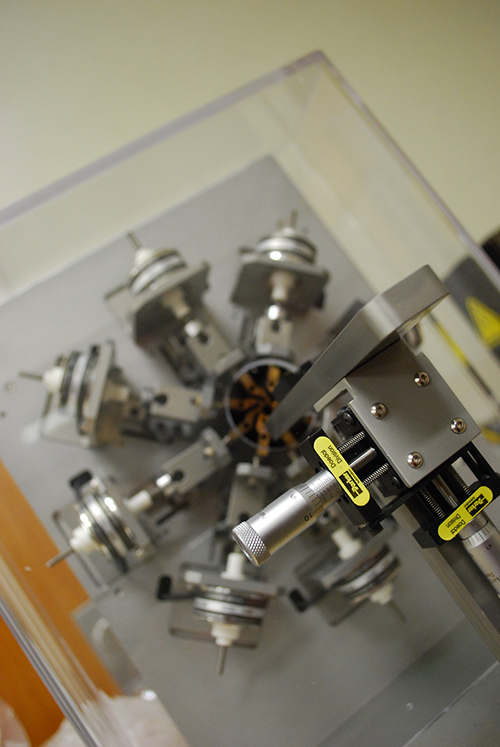 | Image: Photo courtesy of the College of Engineering. Maitland and his team sent the IMPEDE Embolization Plug to the FDA for review in 2017. While the plug is not available in the United States yet, it has been used to treat patients in New Zealand and in several countries in the European Union. There were several milestones that Maitland could look back on in the last two decades of research. He started working on stroke related diseases in 1995. The breakthrough idea for the porous structures for embolization was formulated in 1999. Maitland worked with Dr. Todd Landsman, who initially developed the IMPEDE device as part of his Ph.D. dissertation at Texas A&M. The team’s record in the patent literature documents from 2001, which Maitland said proceeds any publications by about two years. The first shape memory foams research material that was on the right development path was created in August 2011. The work has also led to the establishment of Shape Memory Medical Inc., co-founded by Maitland to commercialize stable, predictable embolization solutions for a variety of clinical applications. The company has 26 issued U.S. patents and multiple patents under review on a worldwide basis. Several of Maitland’s graduate students have worked in the company over the years. Maitland moved from the Lawrence Livermore National Laboratory in California to Texas A&M with the goal of commercializing the SMP foams for vascular occlusion. He liked the policies within Texas A&M, specifically the Texas A&M Engineering Experiment Station (TEES). He said Dean M. Katherine Banks has created an environment where researchers are able to work on impacts that extend beyond traditional academic metrics. At the same time, faculty must respect traditional metrics: Maitland has graduated 14 Ph.D. students and seven M.S. students since joining Texas A&M in 2008. He has also cumulatively published more than 75 journal publications related to the SMP technology and devices. “Working on this kind of impact was made possible by the support of TEES, by conflict of interest management policies of the university and the implementation of those policies out of the Division of Research’s office,” Maitland said. Now that the device technology is in the hands of Shape Memory Medical, Inc., which will work on product commercialization, Maitland said new research directions are opening up. In the short term, his team has sponsored research with the company and has received some grants that are allowing them to research how the devices interact with the body and a deeper understanding of device safety. Over the long term, his team plans to continue working with the company to modify the material so that it increases the effectiveness or opens up new medical applications. Maitland is also partnering with researchers in veterinary medicine, the Health Science Center and other TEES centers to open new application directions for the SMP technology. 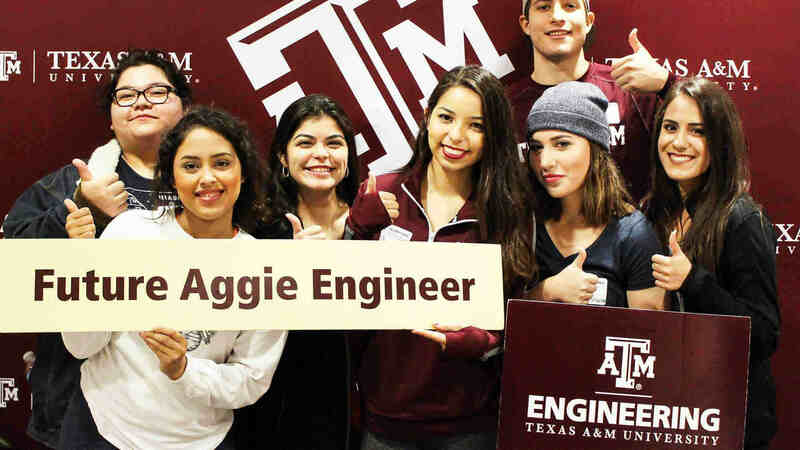 Along with about 200 people who have touched the project in one way to another over the last 20 years, institutions that have provided support include Shape Memory Medical Inc., the Texas A&M Engineering Experiment Station, Lawrence Livermore National Laboratory, the National Institute of Biomedical Institute of Biomedical Imaging and Bioengineering, and the U.S. Department of Energy.